Los Altos vs. Monday’s St. Joseph-Yorba Linda winner. No. 2 Sierra Vista goes down: There will be no all-area match-up in the CIF-Southern Section Division 6 girls soccer semifinals next week, a pair of teams from the Valley View League made sure of that. Not long after Oxnard Pacifica eliminated third-seed San Dimas 1-0, visiting Camarillo jumped on top of host Sierra Vista and held on for a 3-1 victory over the second-seed Dons in the quarterfinals on Friday. The Dons, who won the school’s first team championship of any kind by winning the Division 7 title in 2010, were eliminated from the quarterfinals for the third consecutive year. It ends another remarkable year, finishing 21-4, marking the fourth straight season the Dons finished with just four losses or less. LA PUENTE — For the Los Altos High School girls soccer team, the CIF-Southern Section playoffs have been all about payback and squaring the Conquerors with opponents who have dealt them postseason death in recent years. Sophomore midfielder Natalia Elizarraras scored a goal and had an assist to lead and the Conquerors got back at Granite Hills with a 3-1 victory in a Division 3 quarterfinal game at La Puente High School. Erin Myers and Melanie Moreno also scored goals for the Conquerors, who improved to 21-2-3 and advanced to Tuesday’s semifinals against either Yorba Linda or Lakewood St. Joseph, whose quarterfinal was postponed until Monday due to Friday’s rain. Could former Baldwin Park great and once UCLA interim coach Mike Johnson take over at Diamond Bar? 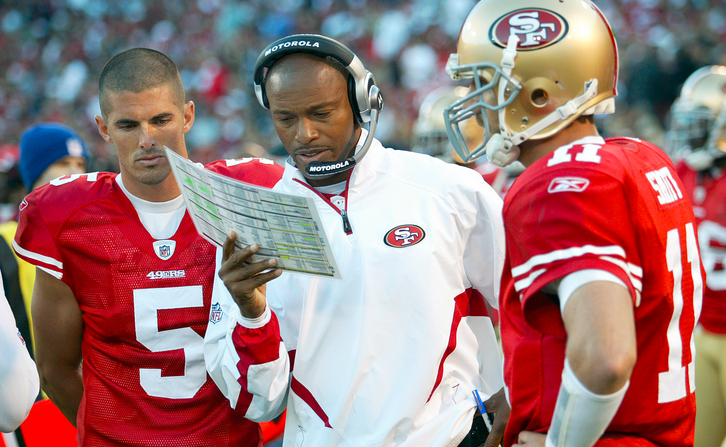 Could Mike Johnson, who starred at quarterback for Baldwin Park in the 1980s, was an offensive coordinator with the San Francisco 49ers and UCLA assistant coach with Rick Neuheisal, become the head coach at Diamond Bar? Johnson, who became the interim head coach at UCLA when Neuheisal was fired, apparently contacted Diamond Bar athletic director Kurt Davies about the position, Davies confirmed. Johnson, who was not retained by UCLA when Jim Mora was hired in 2012, still lives in the Bay area. The dilemma for Diamond Bar officials is that Johnson might not be interested in teaching, and would need to be compensated in other ways, probably through camps and other incentives, according to sources. What Diamond Bar needs to consider is do you hire a big-name like Johnson and run with it, or do you go another direction worrying that he could leave after a brief stay? HERE IS WHAT MUEMA POSTED ON INSTAGRAM EARLY THIS MORNING: Okay here’s is the Seahawks #8 story. I was given #8 the first time playing football started to love this number. I was wondering if I could be 8 in the NFL & he said go to the store to decorate your living space. Went to the Christian store lady says when did that get in & didn’t let her grab it & said it was for me. Later, I ditch the combine to go to the saturday service & speaker was GM for Seahawks. I was honored by the Rev for being the 1st out of 8 yrs to go to this service, I cried 🙂 If I would of performed that day I would of missed that meaningful #8. Glory be to God. Keep calling them coincidences if you want to. 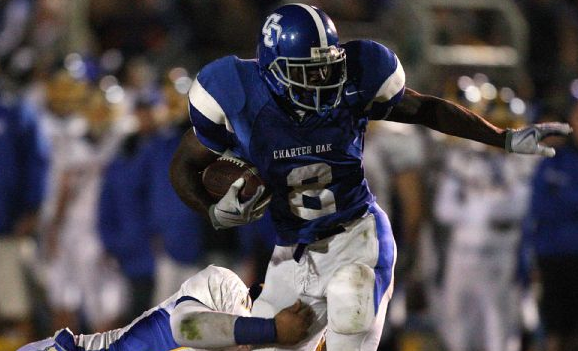 THURSDAY’S STORY: The unusual behavior of former Charter Oak High School running back Adam Muema, who left the NFL Scouting Combine last weekend without working out after saying he was “following God” has become rapidly more concerning to his former high school coaches and longtime friends. Muema, who was this newspaper’s Player of the Year in 2009 after a stellar prep career, starred in college at San Diego St. before declaring for the NFL Draft last fall as a junior. Nobody has seen Muema since last weekend when he left Indianapolis, Ind. where the NFL Scouting Combine is held. He said that by not participating in the workouts he would realize his dream of playing for the Seattle Seahawks. He also said God told him to sit down and enjoy the peace. Lakeside at Cathedral, 3 p.m.
Sierra Vista at Oak Hills, 3 p.m.
Santiago at Marshall, 3 p.m.
Baldwin Park at Estancia, 3 p.m.
Baldwin Park wins late— Baldwin Park is a game away from playing for its second championship in four years after outlasting host Diamond Bar 2-1 in the CIF-Southern Section Division 5 boys soccer playoffs on Thursday, getting a 75th minute goal from junior Cesar Medina for the game winner. 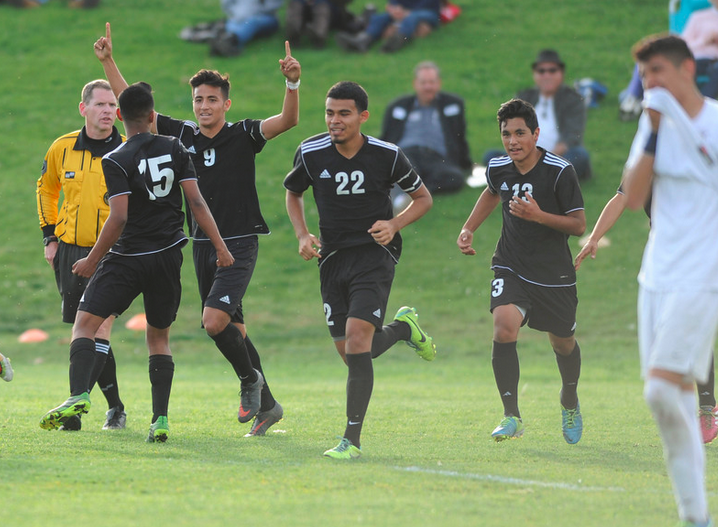 Diamond Bar, which scored a goal in the final minutes against second-seed Monrovia to tie it and eventually win in penalty kicks, nearly sent the game to overtime again. 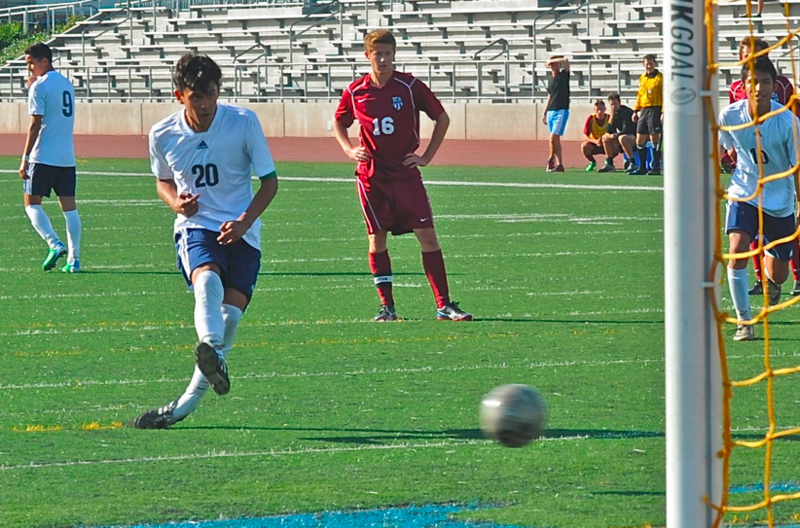 On a 20-yard free kick with less than a minute remaining, Brahmas senior Andre Gamboa ricocheted his shot off the post, and Baldwin Park was celebrating shortly after. Sierra Vista moves on: Possession might be nine-tenths of the law in real life, but in soccer possession is not everything, or even 90 percent. On Thursday afternoon, Ontario had the majority of the possession, but it was Baldwin Park Sierra Vista that had the better chances and better results. Michael Flores scored two goals and the Dons downed defending CIF-SS champion Ontario 3-0 in a Division 4 boys soccer quarterfinal game at Ontario High School. Northview rally comes up short: The best season ever for the Northview High School boys soccer team will not include a CIF-Southern Section championship, but the Vikings died hard Thursday. Jorge Cardenas had two assists and top seed Santiago, of Garden Grove, held off Northview’s second-half charge to score a 3-2 victory in a Division 5 quarterfinal game at West Covina High School. The Cavaliers, getting goals from Derian Lopez, David Yepez and Israel Espinoza, improved to 18-4-4 and will face Marshall, which beat Godinez on penalty kicks, in Tuesday’s semifinals. Northview, getting goals from Carlos Maya and Robert Munoz, both in the second half, finished 17-5-2. It was the Vikings’ first trip to the quarterfinals. The unusual behavior of former Charter Oak High School running back Adam Muema, who left the NFL Scouting Combine last weekend without working out after saying he was “following God” has become rapidly more concerning to his former high school coaches and longtime friends. Follow the SGVN Daily Playoff Schedule and Scoreboard. Help us post final scores by tweeting results to @SGVNSCORES AND @SGVNSPORTS. Also, call in results to 626-544-0992 for a write-up in the newspaper and online. CINDERELLA GLADSTONE FALLS TO NO. 2 ST. FRANCIS: Cinderella’s glass slipper was decided by athleticism. Gladstone High School was making its first CIF-Southern Section boys basketball playoff quarterfinal appearance in 41 years. 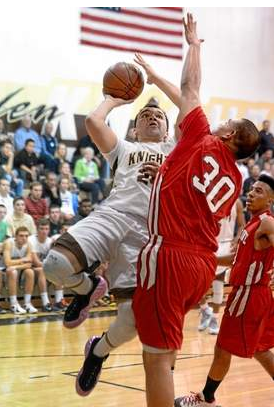 St. Francis was trying to make a semifinal game for the first time in school history. TEMECULA — Damien High School coach Matt Dunn, despite seeing his team team win 23 of 31 games during the regular season, believed something wasn’t quite right with his Spartans this season. Those concerns came to fruition Tuesday night. Torrin Webb scored 24 points and Latrelle Franklin had 18 and host Great Oak ousted Damien from the CIF-Southern Section playoffs with a 71-65 victory in a Division IAA second-round game. Great Oak, also getting 11 points from Isaiah Wesby and 10 from Jeremy Smith, improved to 20-8 and will travel to Inglewood for Friday’s quarterfinals. Jeremy Hemsley scored 37 points for the Spartans, who finished 24-9. It’s the Spartans earliest playoff exit since 2008. BISHOP AMAT ELIMINATED: Bishop Amat senior Eric Fonseca fought back tears following a 62-42 loss to top-seeded Santa Barbara in the quarterfinals of the CIF-Southern Section Division 3A boys basketball playoffs on Tuesday, a tough end for a player and team that few thought could reach the Elite Eight. 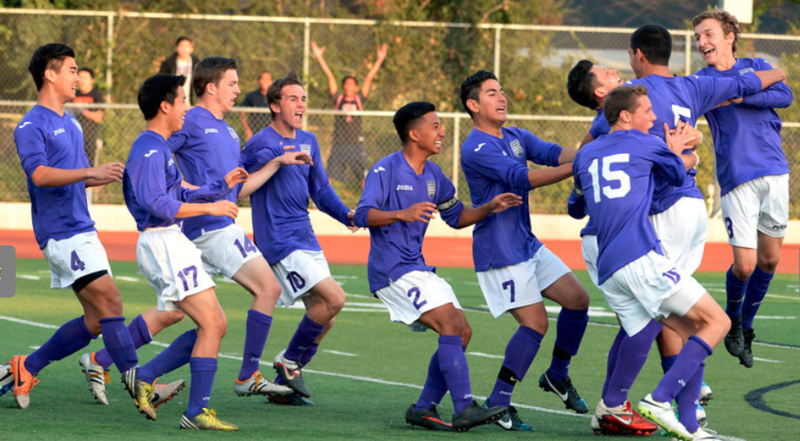 DIAMOND BAR ADVANCES: A near-perfectly played CIF Southern Section soccer playoff game came down a matter of misses. After visiting Diamond Bar and Monrovia played to a 2-2 tie after 80 minutes of regulation and 20 minutes of overtime, the Brahmas prevailed, outscoring the No. 2 seed Wildcats 3-2 on penalty kicks to advance to Thursday’s Division 5 quarterfinal. The Brahmas will play host to Baldwin Park. VEGA GOES NUTS: Danny Vega was a seldom used freshman when Baldwin Park won a CIF-Southern Section Divisional boys soccer title in 2011. 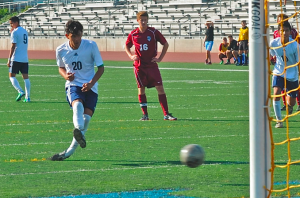 Now he’s the guiding force to the Braves’ chances of winning their second championship in four years, showing why and how by scoring all four goals in an easy 4-0 victory over visiting Laguna Beach in the second round of the Division 5 playoffs on Tuesday. Vega scored on a penalty kick in the 13th minute, and worked a text book give-and-go with Jesus Granados to go up 2-0 in the 23rd minute. Valle Vista league champion Baldwin Park (18-4-2) will be on the road in Thursday’s quarterfinals against Diamond Bar (17-7-1), who outlasted No. 2 seed Monrovia in penalty kicks 3-2 after a 2-2 tie in regulation and two overtimes. Sierra Vista at Ontario, 3 p.m.
Garden Grove Santiago at Northview, 3 p.m.
Baldwin Park at Diamond Bar, 3 p.m.
Baldwin Park’s Danny Vega scores third of four goals, watch how Baldwin Park works this from the back.